…… those are the colours of my garden at this moment in time. There is some white and a bit of pink and blue dotted around for good measure, oh and let’s not forget the luscious red of the strawberries but on the whole yellow and green are the key colours this week. 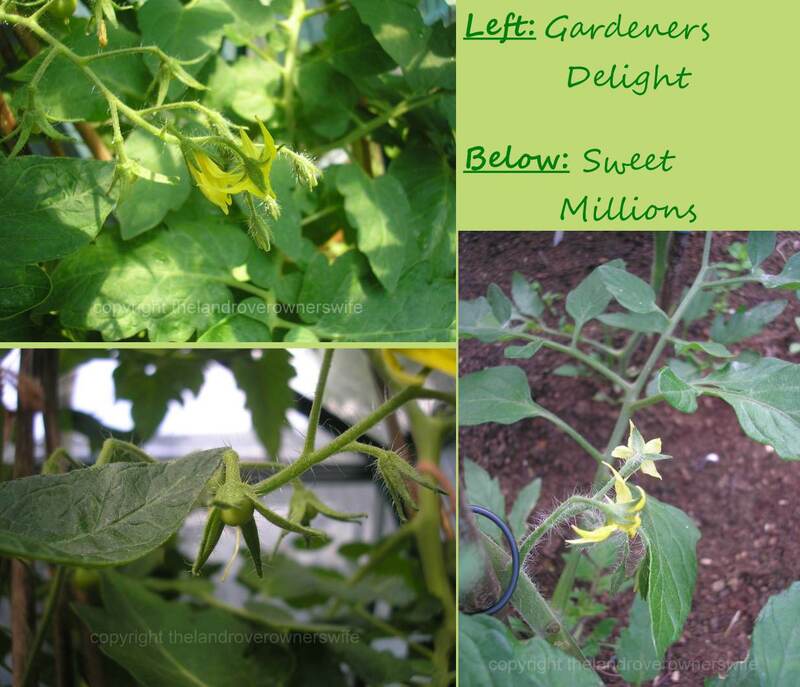 It’s not surprising really, what with 4 types of tomato growing and two of these are currently flowering, one of which has the first tiny green tomatoes of the year swelling and next to the tomatoes in the greenhouse, the first of the cucumber flowers is resplendent, enticing the pollinators in. Back outside and the various squashes have several large, yellow flowers open, waiting for the bees to spot them and come do their job and many more flowers can be seen all the way back along the vines – if the weather holds, this could be a bumper year for squash. My fingers and toes are crossed, as I love the sight of squash growing on the vines and the amazing display they can make during the Autumn, once harvested and brought inside for storage purposes. Even the pumpkins are flowering (yes I know they are part of the squash family but I always like to give them a separate mention). In the raised beds, not to be out done, the courgettes are also a mass of large yellow flowers and, despite their lamentably slow start, now present the possibility of a glut to beat all gluts. You see, just after I planted out my first lot of courgettes, the weather turned very, very cold again and I thought that I had lost these. 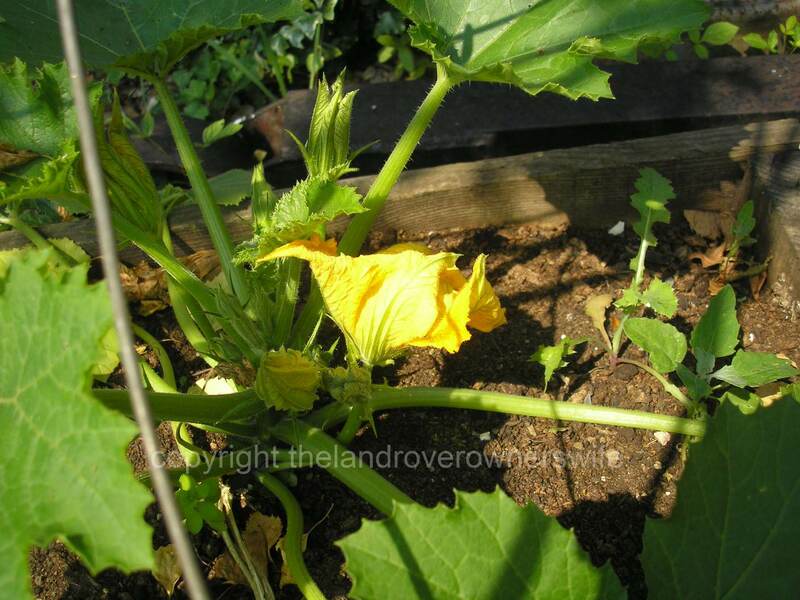 So, just like I did with the squashes, I sowed some more seeds …… and they all came through ……. 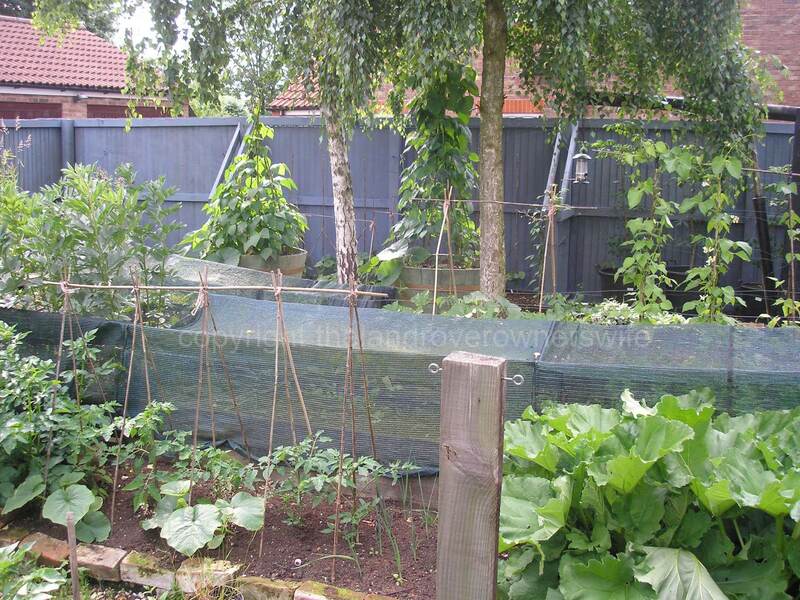 and I planted them out …….. and the others survived and now they are all going to fruit at the same time!!!! It’s a good job courgettes are easy to freeze and take to freezing well! 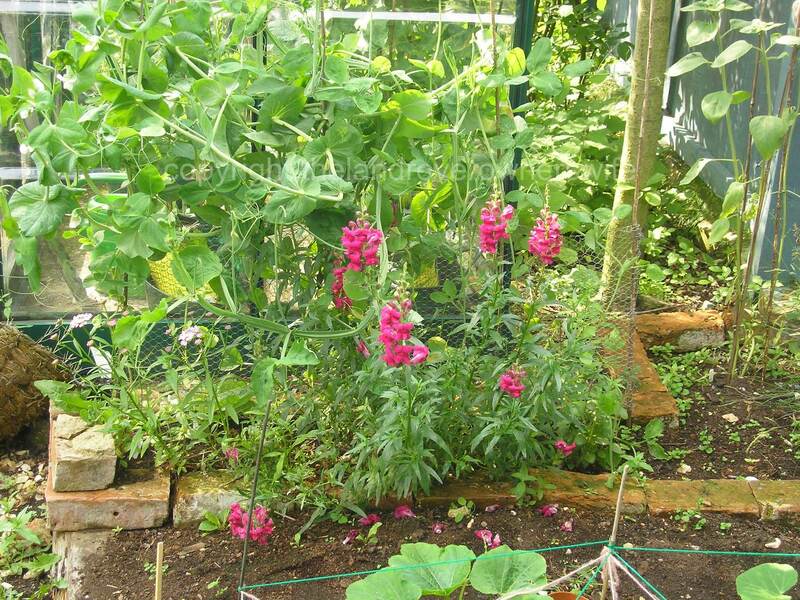 There is a touch of colour amongst the flowers in the vegetable garden flower bed, with the dark pink snapdragons, purple sweet peas and a paler pink of a flower which I don’t know the name of. 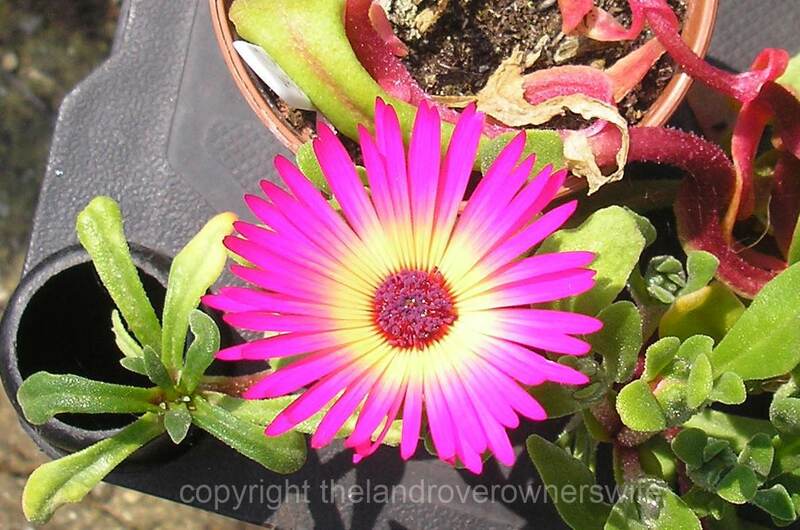 A solitary vivid pink Livingstone Daisy is still sitting in its’ pot – the remainder of these beautiful flowers which were planted out a few weeks ago, were had by the slugs and I’m loathed to consign this breathtaking specimen to the same fate. Overall, the garden is looking lush and green now, a stark contrast to the beginning of June when the unseasonably cold temperatures meant that the plants were still shivering in their final placements, even during the day and were, therefore, reluctant to grow. Now, 5 weeks on, the temperatures are much better, the sun has shown its’ face a few times and the bees have ventured out in their droves and are doing the vital job of pollinating everything. 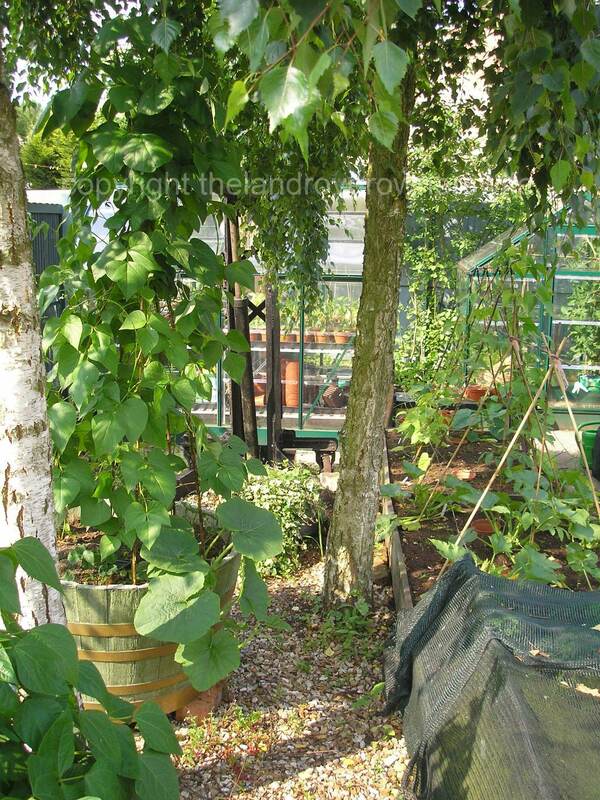 This weekend is set to be a scorcher by all accounts and I do so hope they are right about that as I have potatoes to earth up, broad beans to pull out and Kohl Rabi to plant in their place. As for Mud, he is hoping to finally get Ciggys bulkhead stripped back to bare metal, primered and painted, then we can start to bolt everything back on and our little green Land Rover will be one huge step closer to being back on the road, for good! Categories: .... on growing your own | Tags: Food, gardening, grow your own, Pumpkin, Squash, vegetable gardening, vegetables | Permalink. I love growing flowers amongst the veg – so pretty. I also love the way you set out the pages of your blog; I have a lot to learn!! Everything is looking brilliant! You have such a great variety. W are having a warm spell too so happy sunny weekend!